Today was about as EPIC as fishing gets. Due to the Transmission problem on the OverUnder, we were able to use a friend’s boat for the final day, a 52′ Viking called “So What” We had a stiff 15 knot SE wind and is was obvious a new, better piece of water moved into the area. We had a lot of scattered weed again. As I was letting out the first line a white marlin piled onto the bait and he was hooked up well for a while then popped off. Everything was super aggressive today, and dolphin were crushing our teasers! 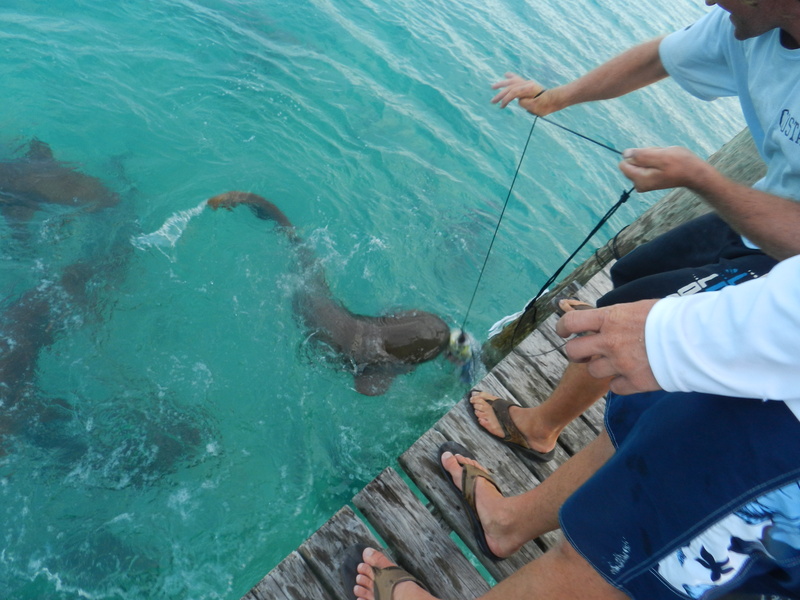 Early in the day Mark got to tangle with a nice Bull that turned out to weigh 54.5 pounds. It put on an awesome aerial display after it was hooked and after a solid 15 minute battle the fish was in the boat. We fished around the Caves most of the day and had a lot of bilfish bites. 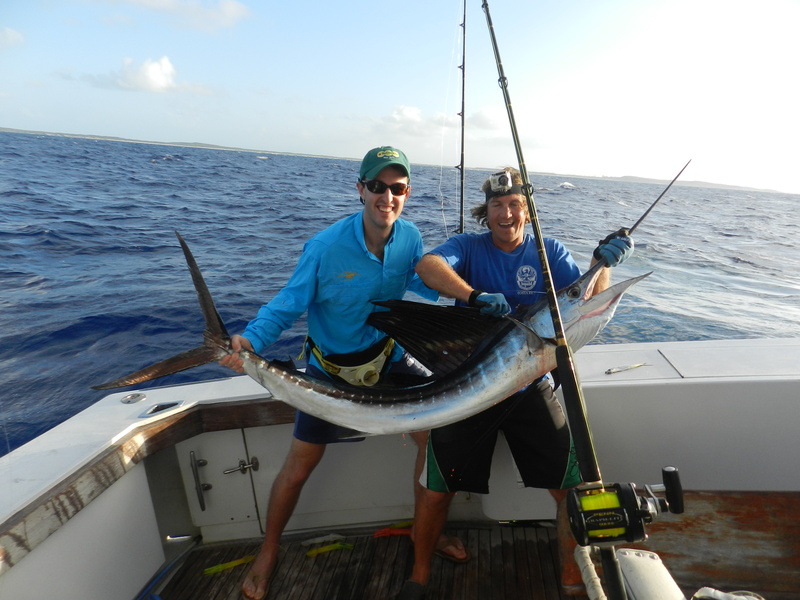 We managed to pick up a sailfish and a shortbill spearfish was a really wild catch since you rarely ever see them. We had 4 sailfish bites, a blue marlin, 3 white marlin, and the spearfish come into our spread today. It was one of those days where things just didn’t quite pan out right with the marlin. Some would get hooked and jump off, and some were just flat out blind bites and missed. Needless to say it was frustrating since we missed a solid shot at a Super Slam, but it was an action packed day of fishing and everyone was amped. 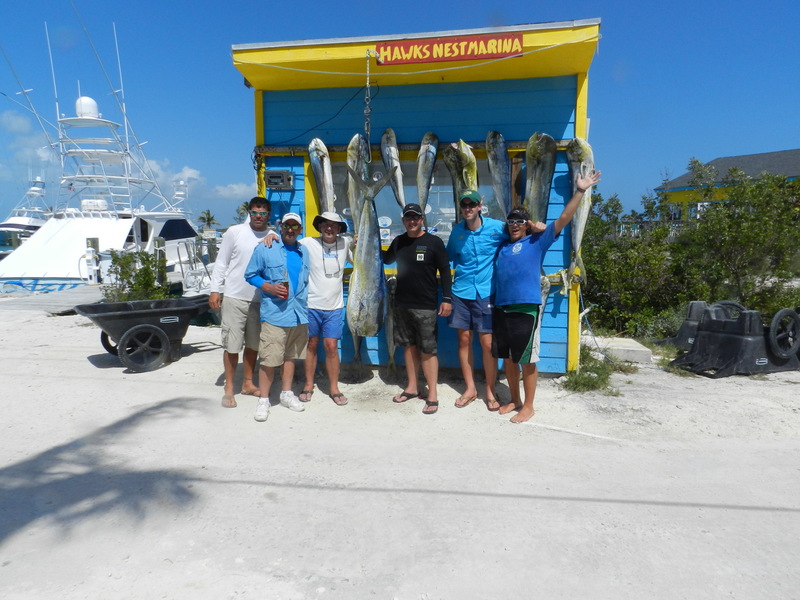 Thanks to Gary, Rich, Mark, and Drew for fishing with us! We definitely had an awesome time! Today was super choppy which made it tough to fish. We still wound up catching 10 dolphin. We had a nice wahoo on but after a few minutes it chewed through mono leader. 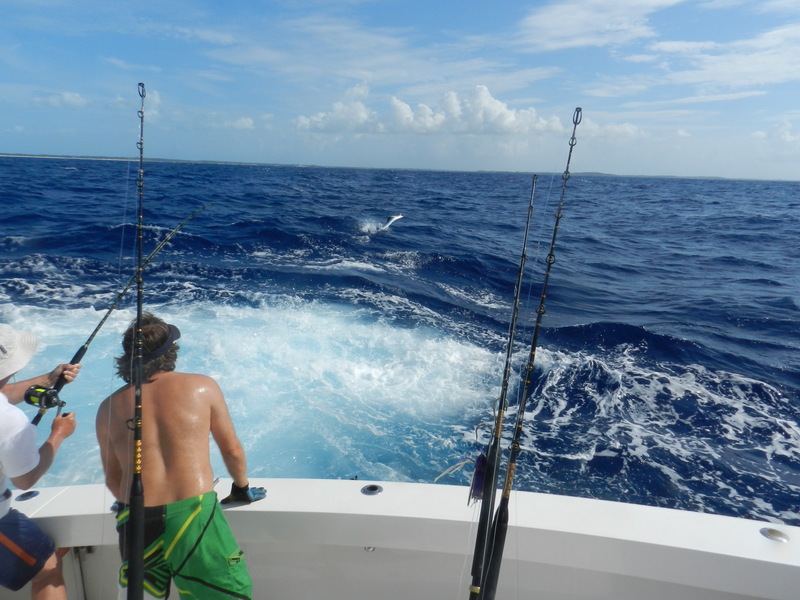 We hooked up a white marlin mid day but it wound up jumping off after a few minutes. Tough fishing today. Today we had a new group out consisting of Gary, Drew, Rich, and Mark. We were greeted with a stiff 20-25 knot SE wind and choppy 4-7 foot seas. 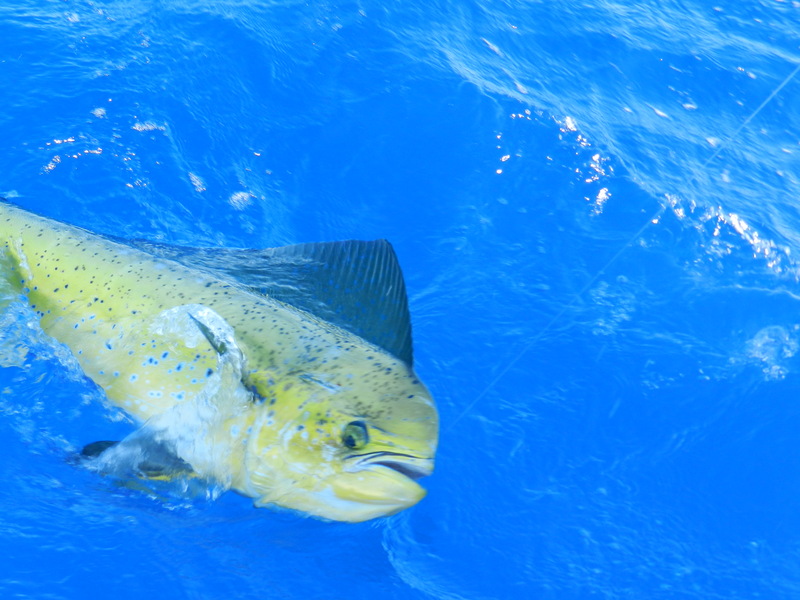 The fishing was consistently good all day as far as action went with Mahi. We caught over 30 dolphin throughout today with the biggest weighing in at 57.5 lbs. it was a massive bull dolphin caught by Rich. 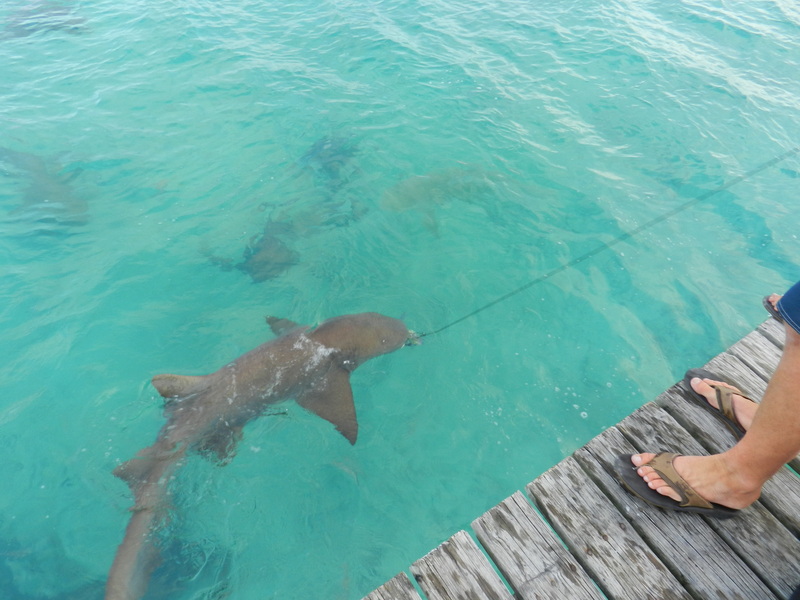 We had a quad hookup and as everyone was fighting their fish, Captain Joe pointed out a bigger one. We were able to get it to eat to naked ballyhoo and got him. 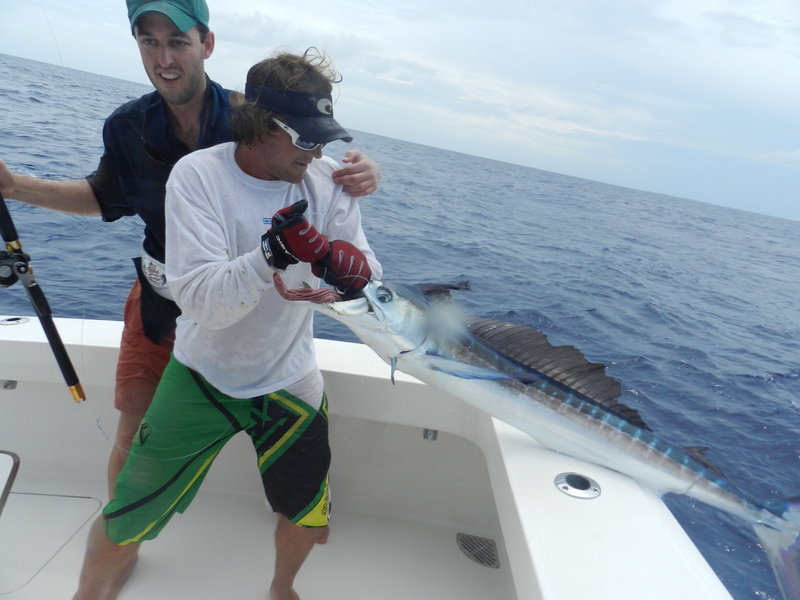 We also caught one sailfish which was Drew’s first. Solid day of fishing! Today was our last day with Bob, Chris, and Debbie. We had a stiff 20 knot wind out of the SE with 3-6 foot seas. The morning started off full of action with a lot of dolphin. We had a blue marlin on the right teaser and I had the pitch bait out for it and as the “bait and switch” was going down a dolphin beat the blue to my bait. We had a white marlin in our dredge and our teaser, but neither would eat. 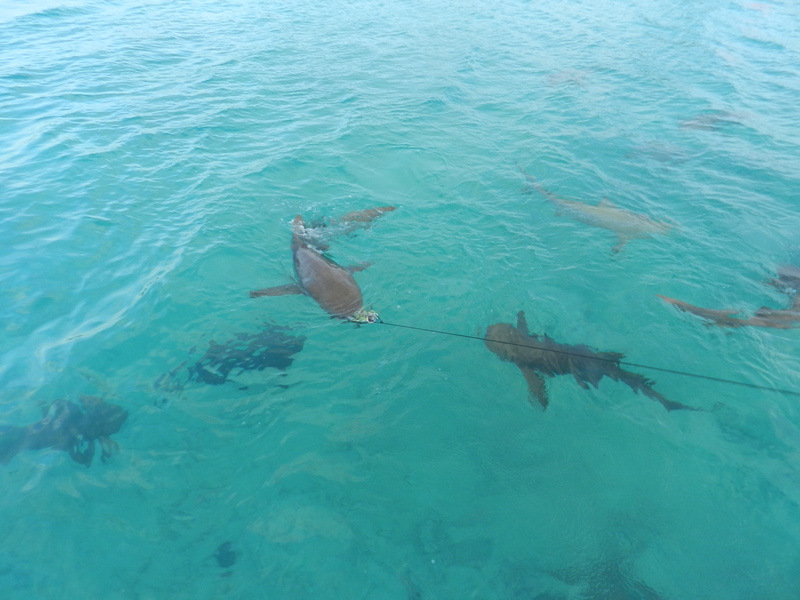 Later in the day we hooked up a white and the line got caught up on a whitetip shark and the line popped. Just one of those kinda days I guess. 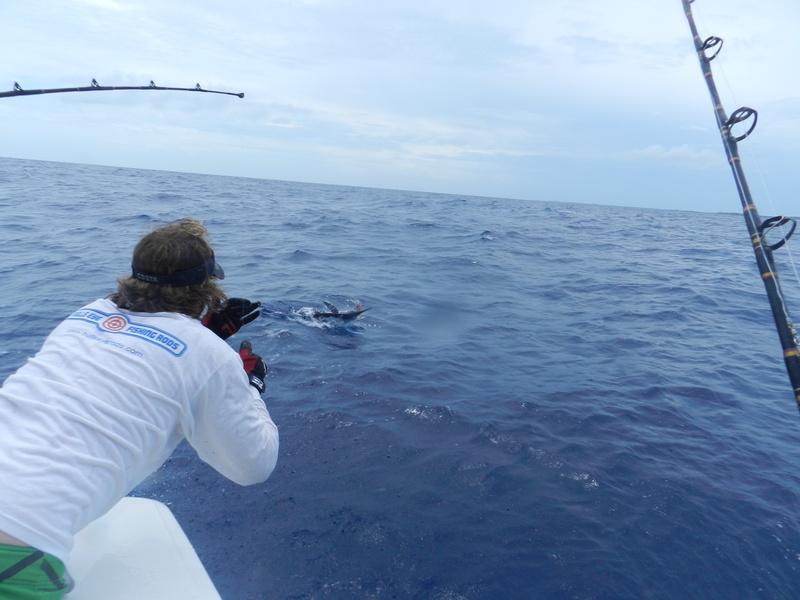 We continued to pound it out through all of the dolphin, but no marlin releases today. It’s supposed to be pretty windy and rough the next few days so fishing is going to be a little tough. Thanks to Bob, Chris, and Debbie for fishing with us. 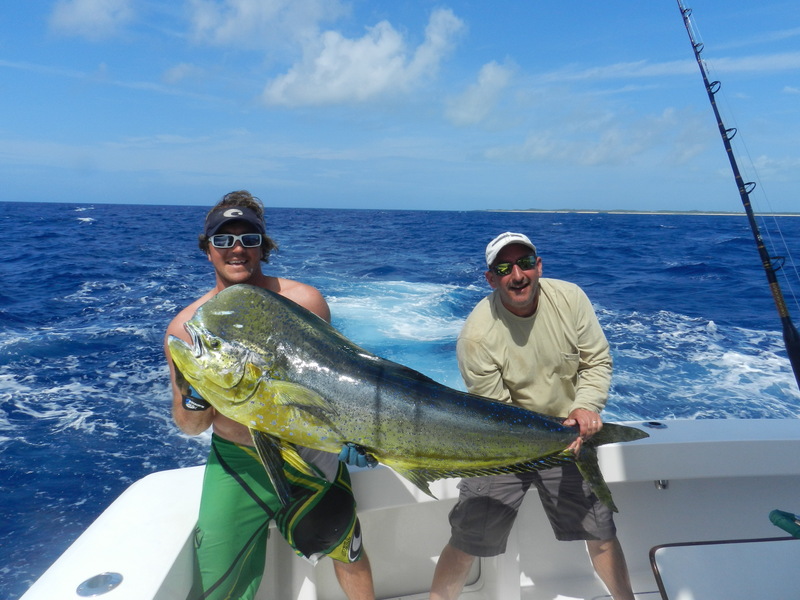 Joe and are are stoked we could get you on some great billfishing action! Today we had beautiful sea conditions like yesterday. It was sunny and super hot and the water was so blue when the sun was high. We wound up seeing 11 billfish today and released 3 white marlin and a sailfish. 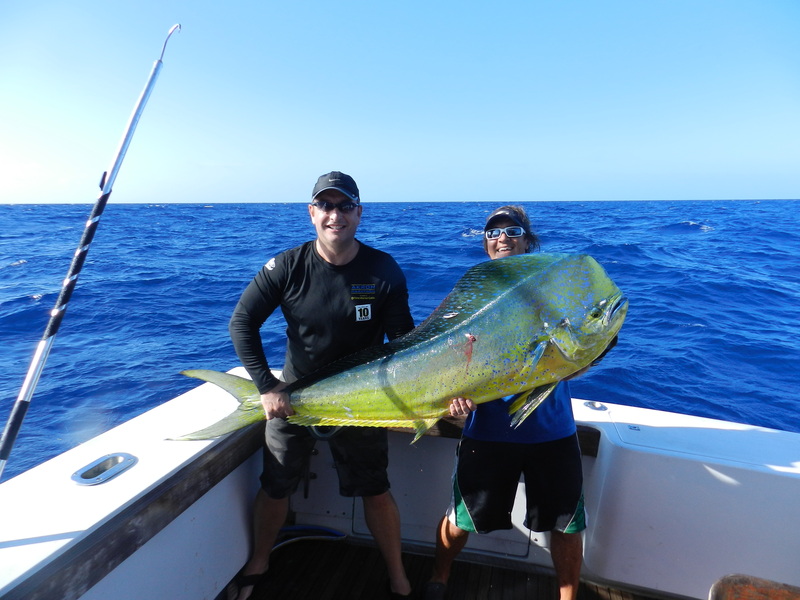 We also put 7 Mahi in the box, one weighing in at 40 lbs and also a small blackfin tuna. We saw the tunas on the surface a lot today, but all were small footballs. Excellent day of fishing!